In this exclusive clip (above) from Thursday’s episode, a time-displaced Nathan (Lucas Bryant) comes face to face with Lucy (Emily Rose), the 1983 version of the Audrey persona whose presence in the tiny Maine town is well documented throughout the series. Nathan is clearly taken off guard to see Lucy in close quarters with a younger version of his father, Garland (Landy Cannon). This episode of “Haven” was written by Sam Ernst & Jim Dunn, who created the show. The episode will also feature the return of Steve Lund as James Cogan, aka the Colorado Kid, whose murder in 1983 was a catalyst for major storylines that have unfolded in the show’s five seasons. 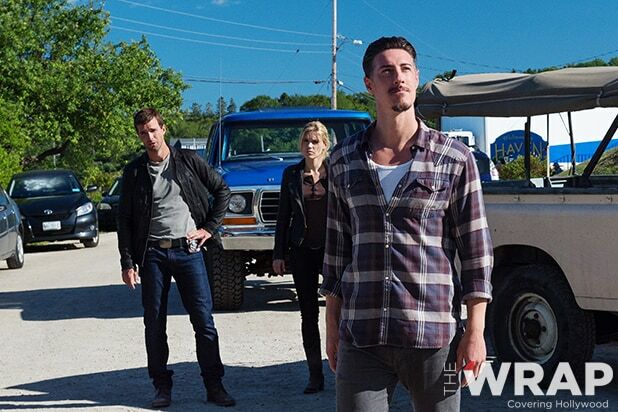 “Haven” airs Thursdays at 10 p.m. ET on Syfy.